1. Add cardamoms to milk and boil. 2. 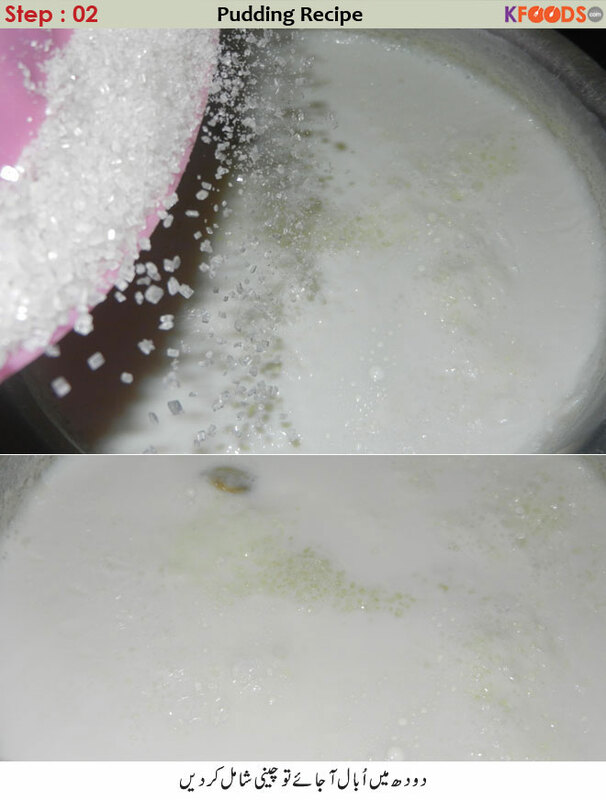 Add sugar when the milk gets boiled. 3. 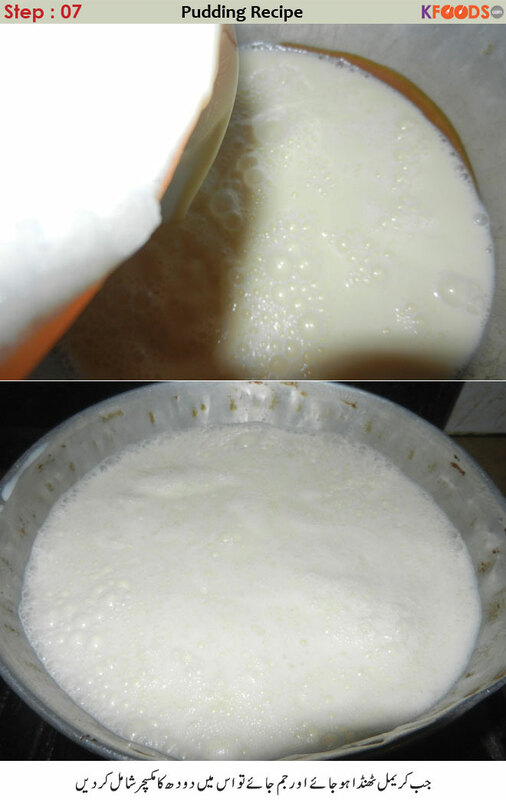 When milk is cooked well and gets browner, take off from the stove and cool. 4. After milk comes to normal temperature, add in blender with eggs and blend well. 5. Place the pudding pan on stove, heat up and add sugar. 6. 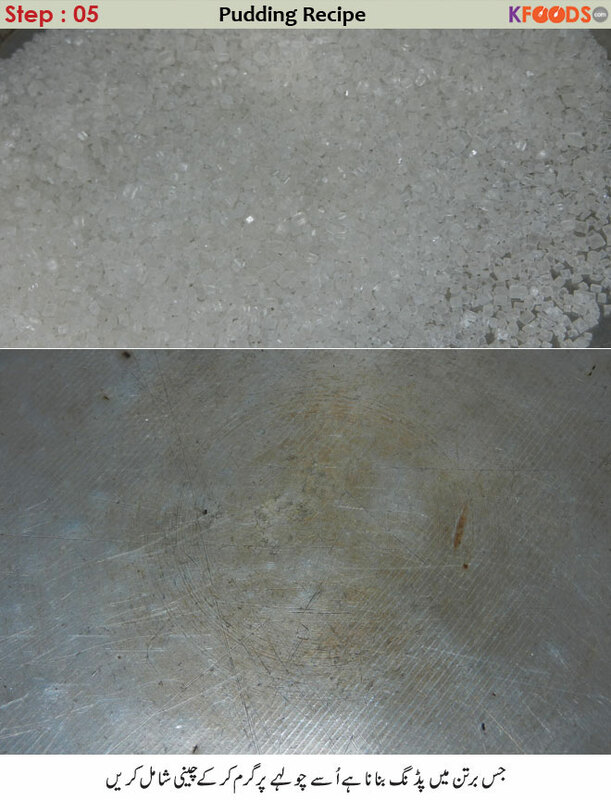 When sugar is melted and browned, take off the pan from stove and spread the sugar across the pan. 7. If caramel is cooled and solidified, add the milk mixture to it. 8. Heat up oven at 180 degrees, place kneading tray inside and pour two glass water into it. 9. Place pudding pan covered onto the tray. Also place weight over the pan to prevent water entrance during baking. 10. After around 50 minutes, check it with a knife. If knife is clear, pudding is ready otherwise bake for 10 to 15 minutes more. Add cardamom to milk and boil. When milk reaches the boiling point, add sugar and cook on low flame. Check if milk color is browner, take off from the stove and place aside for cooling. When milk is completely cold (normal temperature), add eggs and blend them well in a blender. Heat up the pudding pan. When heated, add sugar cook on low flame. 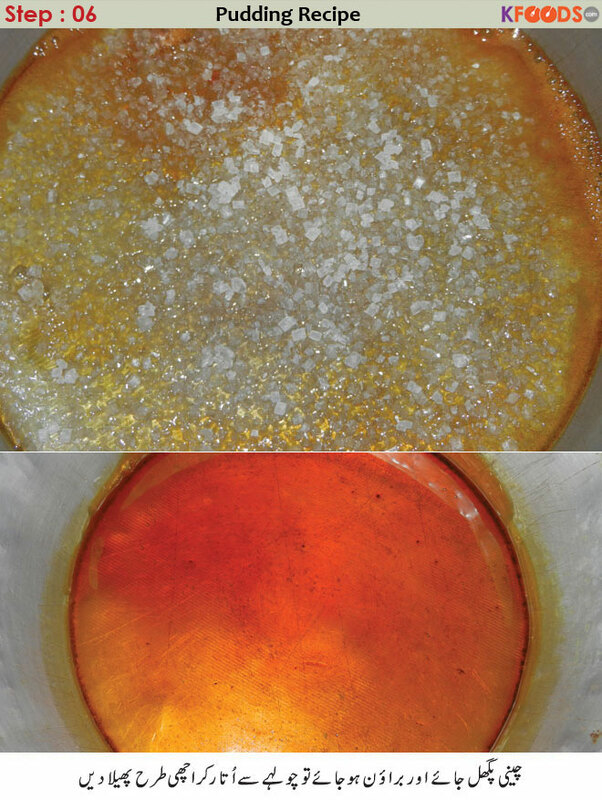 When sugar is dissolved, and becomes golden brown, take off the pan from stove. Spread the melted sugar to the inside walls of the pan because sugar will be frozen upon getting cold. When caramel is cold, add the milk mixture in the pan you prepared caramel. Preheat the oven at 180 degrees. Now pour two glass water into flour kneading tray. Now place the pudding pan into that water. 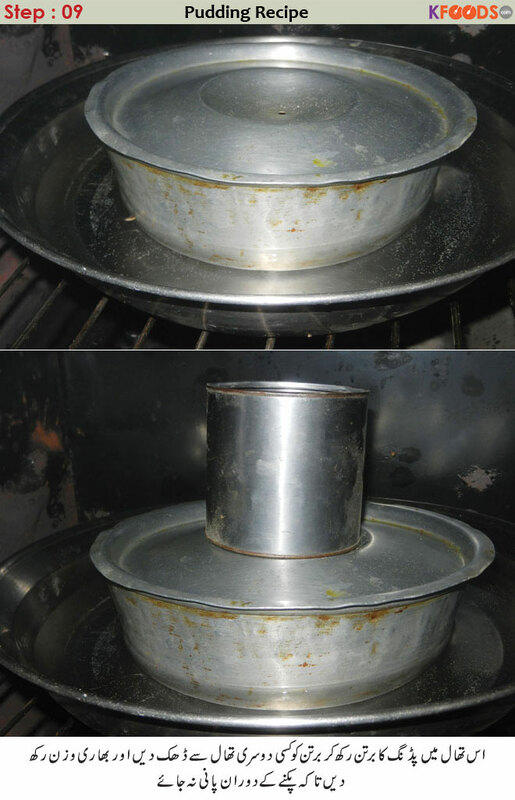 Cover the pudding pan with a lid and place weight on the lid in order to prevent water entrance into the pudding pan. After 50 minutes, check if pudding is ready. Penetrate a knife into the pudding to check. If knife blade is clear, it means pudding is ready otherwise it needs to be baked more for 10 to 15 minutes. Pudding can also be prepared without oven. Add water into a large pan and place onto the stove. Place pudding mould into that large pan. Cover the pan and put weight to avoid water entrance. Pudding is prepared within 40 to 50 minutes on the stove. Check with the knife if pudding is prepared. If knife is clear, caramel egg pudding is ready. Let pudding become cooler. It's better to place it in refrigerator for cooling. When it's cooled, slide the knife all around the pudding inside the pan. Then place a large place on the mouth of pan and turn the pan upside down. Pudding will be reverted easily this way. If you tried to revert the pudding without cooling, it may break. In order to make this caramel egg pudding recipe up to your taste, you can adjust the amount of sugar accordingly. 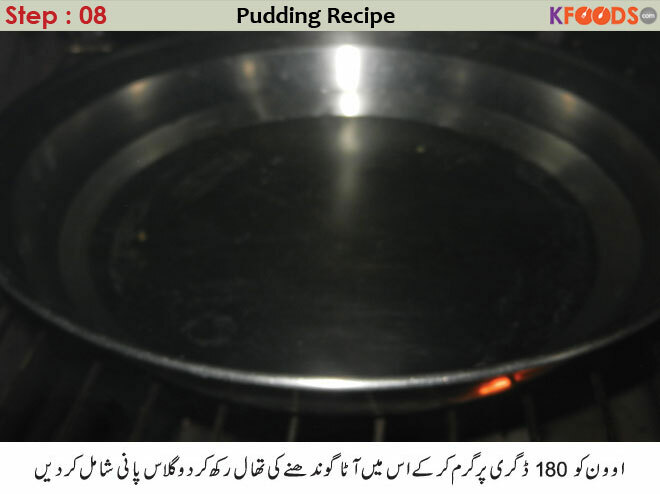 Let's find a delicious egg and caramel pudding recipe in Urdu with step by step easy instructions. 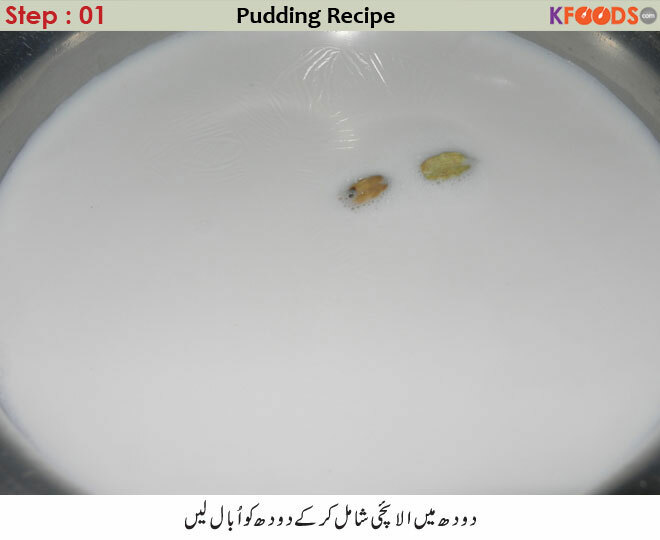 Pudding is full of yummy flavors and very tasty, mazedar pudding is a top listed food item of kids and now its very simple to make at home for your kids and for all the family members as well. Here at KFoods, sharing the best and easy method that how to prepared Delicious pudding in oven or you can also get the complete method of making it without oven. So let's try it at home and make your events memorable. Find all banana pudding, fruit pudding, rice pudding, jalebi pudding and all pudding recipes at one place here. caramel egg pudding is one of the best and easiest desserts I have found online to make for my family. Caramel Egg Pudding Recipe I always liked these kinds of sweet dishes Caramel pudding is very delicious and tasty I always love eating I want to make it at home I made it for my family and they really good I try recipes is quit easy. Caramel egg pudding is so delicious, I can't get enough! The soft, giggly texture, that just melts in your mouth is the best ever dessert. My mother always said that the dessert that melts in your mouth is the best made. Finally! I’ve been looking all over for a proper caramel egg pudding recipe and it looks like I found it. Can’t wait to try this delicious recipe and try my favorite caramel egg pudding! It’s my top best dish! this is awesome recipe thanks for sharing this recipe. this is a very delicious dish I always like this dish thanks for sharing this recipe. Caramel pudding is very tasty and delicious and I always liked these kinds of sweet dishes like kheer, puddings, custard and many similar sweet dishes. I would love to make pudding and serve to my kids. nice pudding, it is favorite of my kids and they keep demanding me for preparing tasteful caramel pudding for them. Before this I used to make it with simply a Rafhan pudding mix however now I will try to make it with this recipe. 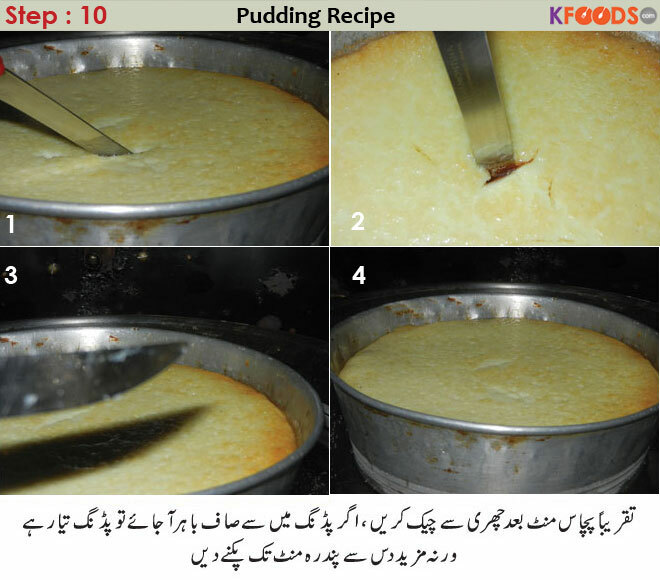 We have always made Rafhan pudding but now we will make this pudding with this step by step procedure. I would gather my elder daughter, she is also very good at cooking foods. I am planning to making this pudding, it looks amazing. Before trying this at home, we always tried to make it with Rafhan pudding, but making any food by self is an amazing experience. I eat pudding but my children are crazy for it. and for them, I have to make it again and again. They like it every time in morning, evening, night. Iss main jo sugar hai melt kia hai...usko kool hone k liye chor diya gaya hai toh jab jam jaye...Toh jamne k liye fridge main rakhai ya pir normal bahar he rakhai??? Read Blog about Caramel Egg Pudding Recipe and health & fitness, step by step recipes, Beauty & skin care and other related topics with sample homemade solution. Here is variety of health benefits, home-based natural remedies. Find (Caramel Egg Pudding Recipe) and how to utilize other natural ingredients to cure diseases, easy recipes, and other information related to food from KFoods.